I was sitting in the packed auditorium as Gary Foley presented 'Life of Struggle' at the 2015 Marxism Conference in Melbourne. He commanded the stage, held the audience in the palm of his hand and I listened fiercely and took notes. 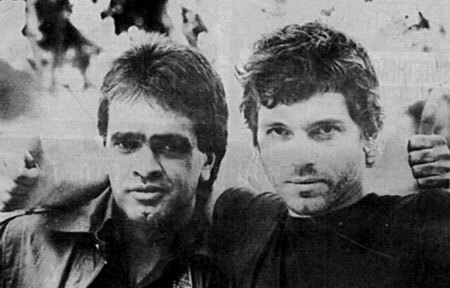 He spoke passionately about the history of Aboriginal resistance in Australia, of which he played a central role and shared iconic images of his life including photos with rock star Michael Hutchence (pictured below). Foley also spoke about an album he'd been involved with titled, Building Bridges - Australia Has A Black History. It wasn't entirely clear then of course but as I listened to Foley talk, a seed was planted and once I'd been selected to participate in the CBAA National Features and Documentary Series, the 1989 Building Bridges album and the story surrounding its creation began to absorb almost every waking moment of my life. 'Red Dirt in Bondi' is a radio feature set in Sydney around the time of the Bicentenary, 26 January 1988. 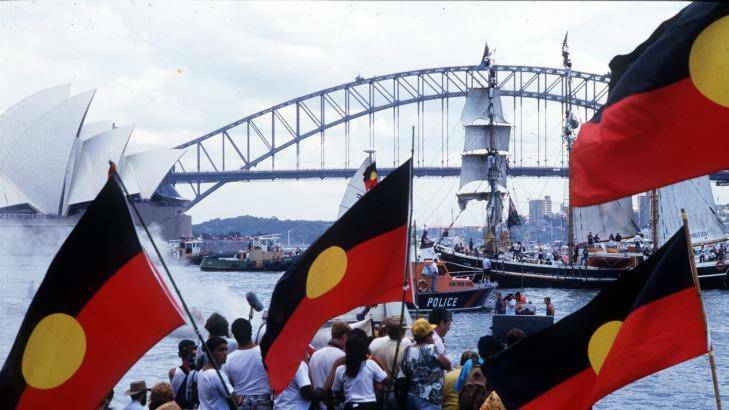 The key participants in this feature are Aboriginal activist and academic Gary Foley, the Building Bridges Cultural Construction Crew featuring Jim George, Tony Duke and Denise Officer (Andrew McMillan passed away on 28 January 2012) and singer-songwriter, Kev Carmody. For a rookie like myself there were significant challenges in bringing this radio story to life including the historical nature of the topic and the complex relationship between black and white Australia since 1788. Not to mention attempting an interesting and thought-provoking radio feature in under 27 minutes. The story of Building Bridges, involving a small group of people with the support of the Australian Music Industry, is as relevant today as it was back in '88. It is vital to keep re-telling and sharing this piece of history so that we may move towards true reconciliation in this country and achieve justice for Australia's First People. I would like to thank Phil Ruck, David Miller and others from 3MDR for their amazing support, the CBAA and CMTO for the wonderful opportunity but most importantly to the 'Red Dirt in Bondi' participants Jim, Gary, Tony, Denise and Kev for sharing the incredible Building Bridges story. 2015 saw another cohort of new and emerging producers join forces with the CBAA and Community Media Training Organisation (CMTO) to create radio features and documentaries. 10 half-hour features from community radio producers around Australia, available to all stations for local broadcast. In 2007 the Hope Vale – Pelican project (now in its 6th year) inaugurated a digital storytelling component into the program. The project is a partnership between Hope Vale Elders (championed by Des and Estelle Bowen) and Pelican Expeditions. In 2007 Pelican Expeditions and the Elders invited Samia Goudie, a researcher and digital storytelling consultant, to pilot a digital storytelling project with Natalie Davey, a founding member of Pelican Expeditions. The Hope Vale – Pelican (HVP) project is mainly run out of Connie’s beach, Cape Flattery in Cape York. The success of this pilot resulted in the design and implementation of a larger digital storytelling media camp being embedded as a co-creative practice in the 2008 Hope Vale – Pelican project. This paper seeks to tell the story of this process and explore some of the early findings of both the benefits and problems of using digital storytelling to promote social and emotional wellbeing and caring for country with an Indigenous community within a trans-disciplinary partnership project.